Abstract: High end memory, like high end graphics cards is considered a luxury item in the world of computers, so what do you do when you need memory for a simple workstation computer? High end memory, like high end graphics cards is considered a luxury item in the world of computers, so what do you do when you need memory for a simple workstation computer? Get some quality affordable RAM and keep on walking past the heat spreader encapsulated parts with tones of flashing LEDs - resist the urge to splurge on fancy memory! The majority of mainstream memory parts are not priced at extreme levels and memory can be quite a bargain if you're not too picky. If you're looking for memory that won't break the bank yet offers decent performance, SyncMAX thinks it has what you need. With a retail price of $100 CDN ($90 US, £49 GBP) , its 1GB kit of dual channel PC2-5300 DDR-2 memory is quite a bargain. The 240 pin SyncMAX PC2-5300 Express memory kit does not come with heatspreaders so you'll want to use caution when handling the memory. 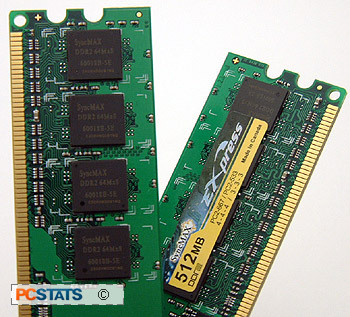 DDR2 DRAM modules are quite fragile as are the IC on the PCB, especially to static discharge. The SyncMAX PC2-5300 Express memory has been certified to run in a dual channel configuration at speeds of 667 MHz with CAS latency timings of 4-4-4. The memory can also be run at 533 MHz (PC2-4300) with tighter CAS 3-3-3 timings if one so chooses. 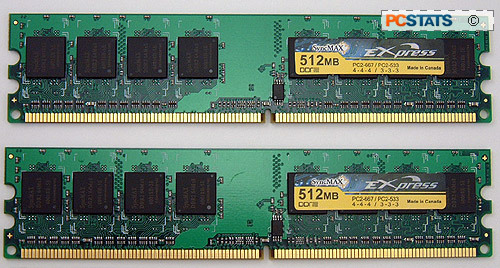 The SyncMAX PC2-5300 Express DDR2 DIMMs are single sided which means there are only DRAM modules on one side of the module. That information might be important to users with limited memory bank support, usually only an issue with some budget-minded chipsets. SyncMAX memory is vendor neutral and its memory functions just fine in both Intel and AMD systems. The SyncMAX brand is based in Markham, Canada and its memory modules are apparently also assembled in Canada. The SyncMAX name is probably an unfamiliar one for most people, but the company does offers a one year warranty on its memory. That's about par with other mainstream memory modules. SyncMAX also offers phone technical support, although our calls kept going to voice mail. To make things easier for the end user, a worldwide toll free 1-800 number would have been nice. SyncMAX remarks the DRAM modules with SyncMAX labels: marked 6Q18B-5E E606H8G0918Q. Unfortunately that doesn't tell us much, but considering the memory's low price, it shouldn't matter.